Uniquely designed jewelry holds a special place in my heart and I have found a company that creates awe inspiring pieces that pleases the eye and soul. I recently contacted The Pretty Peacock and she has generously offered a chance to review a pendant and give one away to one of my readers as well! Ana Talukder Simpson is a brilliant jewelry artisan who creates each one of her hand crafted pieces with love. Please take a moment to read Ana's About Me page to learn more about Ana's company and history. 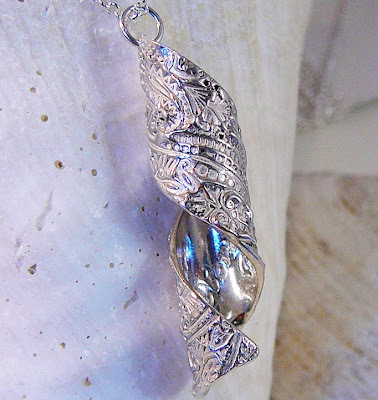 Ana generously sent this gorgeous DreamWoven Sculpture Pendant from the Good Karma Collection for me to review. The moment I opened the package, I was stunned by the beauty within. The box was wrapped attractively in tissue paper with a ribbon and a single, lovely peacock feather. I carefully unwrapped the gift and set the wrapping aside to find the gift box inside. I'd like to mention that this was a complete surprise to me, I had absolutely NO idea which piece I would be receiving. It felt like a gift and my anticipation grew fierce wondering what was inside the box. I still handled the package with care while opening the lid and found the most beautiful hand crafted necklace inside. Ana definitely put her heart into crafting this pendant and I couldn't be more pleased to share this experience with my readers. The pendant swirls with the words hand stamped inside "Find your bliss" and dangles on a lovely silver chain. I cannot express just how much the picture doesn't do this necklace justice. The patterns etched into the pendant is quite detailed. This piece really is exquisite and breathtaking. Thank you, Ana! I adore this necklace. Your turn! How would you like a chance to win a charming piece from the Portals Collection? 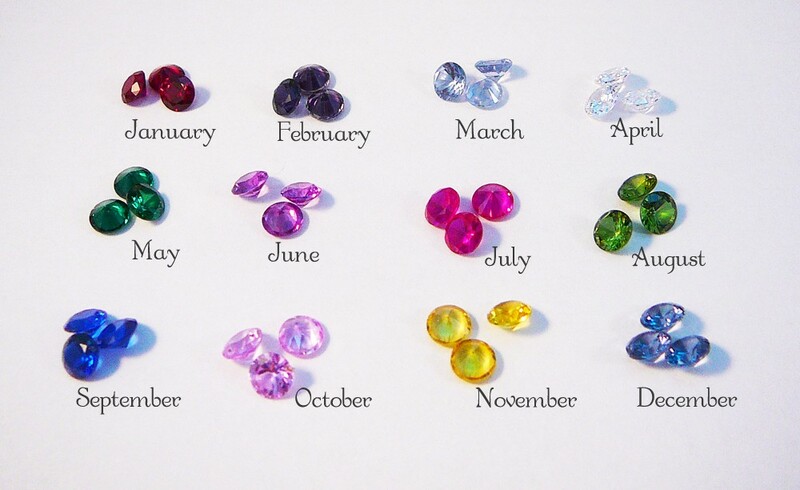 The winner will be able to choose a piece from this collection which includes 2 gemstones of your choice. One winner will win a choice of ONE piece from the Portals Collection with his or her choice of TWO (2) gemstones. Additional stones can be purchased and not included. MANDATORY ENTRY:Visit The Pretty Peacock and share your favorite piece of hand crafted jewelry in a comment below other than the piece mentioned in the review. You may enter daily and this giveaway is open to everyone! DISCLAIMER: I simply received the DreamWoven Sculpture Pendant from The Pretty Peacock and have posted my own, personal and unbiased opinions. I hold no responsibility between you and the company, and/or products you may purchase or receive from them. Sweet Fortunes ~ Keepsake Fortune Cookie Pendant, awesome, thanks for the chance.. I love the Sweet Fortunes ~ Keepsake Fortune Cookie Pendant. I Like The Pretty Peacock on Facebook and posted on their wall 1. I Like The Pretty Peacock on Facebook and posted on their wall 2. I Like The Pretty Peacock on Facebook and posted on their wall 3. I follow you on twitter and tweeted @susanlanai. I love the family stone pendant! I love the Key to the Future ~ Personalized Keepsake Pendant. It is so pretty! The Good Karma Wise Owl is my favorite! 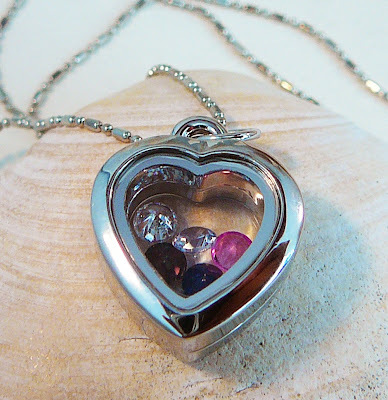 I love the Big sister locket, would make a great gift! I like the Portals ~ The Bracelet ~ Round. I also like the Sterling Silver Beaded And Bumpy Stacking Ring! I'd get the sister keepsake locket for my younger sister. (http://www.theprettypeacock.com/pendants/all-pendants/sister-keepsake-locket.html) We're 7 years apart, but have always been very close. I love her forever! I love the fortune cookie pendant. I follow your blog ready4h2o2yahoo.com Thanks!! I like the Smooth Moves birthstone bracelet. I love the Good Karma Wise Owl pendent. Kristen McNinch: I love the idea of the portal necklaces. I would love to have one of those. I love the Sweet Fortunes Fortune Cookie pendant. I love the Regal Family Tier Pendant. I love the love you to the moon keepsake pendant. I love the family stone pendant and the Dreamwoven Sculpture Pendent. It's unique and beautiful! Stunning! I especially like Portal Pendants: Round with Sparkling Birthstones. I like the Family Stone Keepsake Pendant. Like the Pretty Peacock on FB and left a comment! I love the Embrace Keepsake Bracelet. I like the Love Bloom ~ Personalized Wide-Mouth Bead Pendant. I love the Little Goldies: Sweet and Small Personalized Pendants. I "Like" The Pretty Peacock on Facebook and posted a comment on her wall letting her know you sent me #1. I "Like" The Pretty Peacock on Facebook and posted a comment on her wall letting her know you sent me #2. I "Like" The Pretty Peacock on Facebook and posted a comment on her wall letting her know you sent me #3. I like the Portal ~ Chic Heart Bracelet. My favorite piece is the Thick is Good Sterling Silver Ring. Follower on Google friend connect. I like the Athaya pendant. I love the Family Stone Pendant.